Most Americans have heard the adage "Freedom is never free." Events in recent years have proven the young men and women of our armed forces are paying the ultimate price in increasing numbers. We are all proud of our active duty personnel and their counterparts in the veteran's community. How do we truly thank those whom we owe so much? 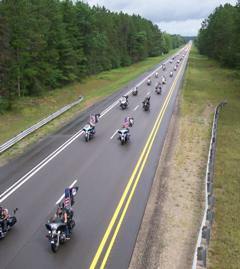 The Ride Around Michigan began in 2004 as a way for everyone to participate in honoring the sons and daughters of Michigan with three days of remembrance. The journey takes motorcycle riders through each of the 83 counties in Michigan. Each chapter within Forgotten Eagles® holds remembrance ceremonies to honor all those who have served and who currently serve our country. The Freedom Ride, done in conjunction with the annual Ride Around Michigan (RAM) is dedicated to our fallen brothers and sisters and the POW/MIA's. The ride begins at Snowbowl Road just south of Houghton Lake. Police escorted down US 27 to the C&S Harley Davidson in Mt. Pleasant where more riders are picked up and then continues from there to the Michigan Vietnam Memorial at Island Park in Mt. Pleasant. 1. Come ride with us! Locate the Forgotten Eagles® Chapter nearest you and accompany them on their journey! 2. Make a financial pledge to support our efforts. As in individual or a business/corporation your donation can help make a difference in the lives of veterans, active duty personnel and their families in need. Forgotten Eagles, Inc. is a non-profit organization as defined in Section 501 c (3) of the tax code. Your financial donation is fully tax deductible within accordance of the law. All proceeds will be used to support veteran related charitable projects. The 2019 RAM Ride for all Chapters is August 7th, 8th and 9th. Contact the Chapter in your area to find out where you can meet up with them. The Freedom Ride is August 10th, 2019.